The type of polishing cloth you use will make a difference. Ideal cloth is nonabrasive, absorbent, and lint free. To eliminate any chance of scratching, use only disposable cloths. Reusable cloths can retain abrasive particles, but you won’t know for sure until the damage is done. 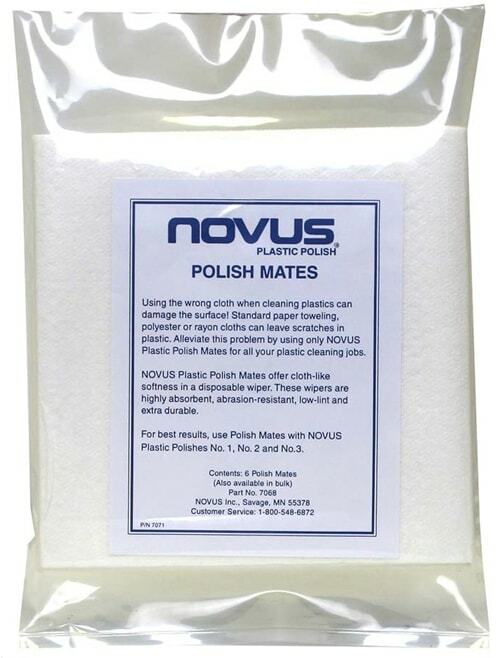 NOVUS Polish Mates are sold in convenient 6- Packs. The type of polishing cloth you use will make a difference. This ideal cloth is nonabrasive, absorbent, and lint free. To eliminate any chance of scratching, use only disposable cloths. Reusable cloths can retain abrasive particles, but you won’t know for sure until the damage is done.